In this exercise your task is to work out the registration fee that participants in a one-day conference must be charged so that the event makes a $1000 profit. 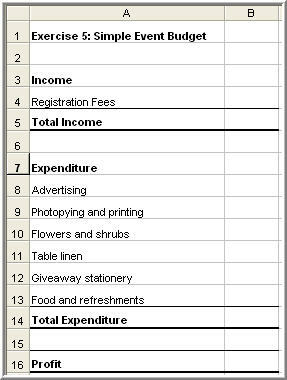 You will need to create an Income and Expenditure Budget to do this. You are planning a one-day conference and you hope to make $1,000 profit out of it. The expected number of persons attending is 100. The conference program will have four (4) speakers and each will be paid $150 for their services on the day. The venue is a hotel function room and it will cost $1,000 for the day. Advertising $1,000, photocopying and printing $500, flowers and shrubs $200, table linen $100, giveaway stationery $200, and food and refreshments for all the participants at $10 per head. What you must find out! How much registration fees will you need to charge each conference participant to make the target $1,000 profit if you have 100 registrations? Download and save the worksheet to your computer by clicking on this link with right mouse button and the selecting "Save Target As".